I've talked a lot about vintage portables in the last couple months, so today I'm going to switch things up a bit and weigh in on the extreme opposite end of the spectrum, vintage industrial machines. While similar to domestics, industrials are typically built for highly specialized operations and perform those functions quickly, tirelessly and efficiently. 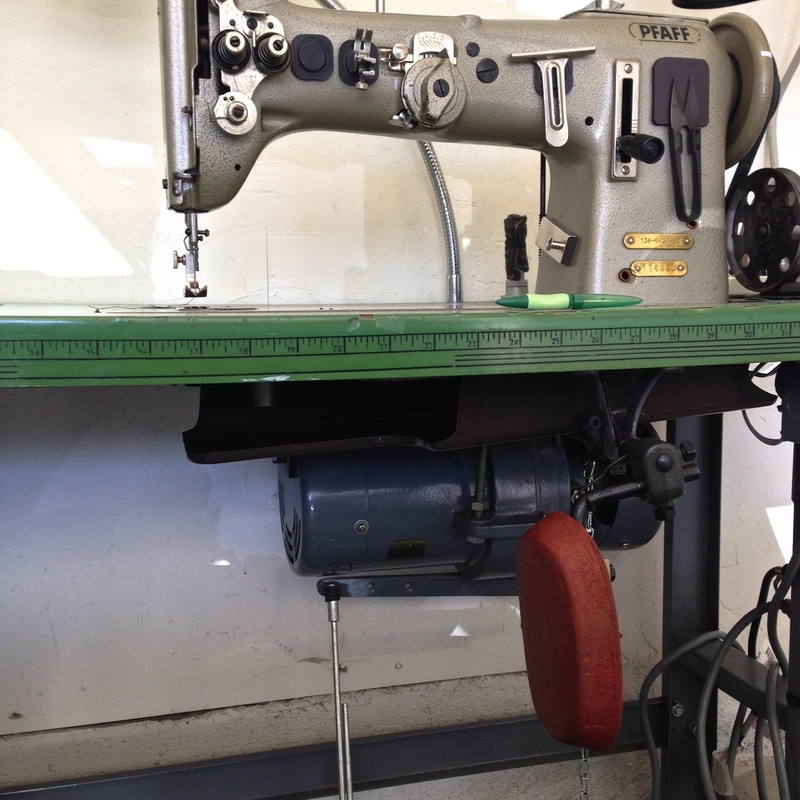 When buying an industrial machine, you often purchase a machine head with a table and motor. Table sizes are standardized and provide an ample 2 x 4 feet work space. Motors are spec'ed according to the type of work required--higher rpm motors provide more speed while lower rpm motors provide more torque and piercing power. This is used in conjunction with different sized pulleys and belts to either maximize torque or speed. The two most common rpm ratings being 1725 rpm and 3450 rpm. Motors also come in clutch and servo varieties. Clutch motors are always spinning at full speed and work by engaging the clutch mechanism via the treadle. Servos are run by electronics and behave very similarly to domestic sewing motors. More on that in a later post. Take one look and compare a domestic sewing motor to an industrial motor and the difference becomes very obvious. Most domestic motors top out at about 1 amp with the beefiest hitting 1.5 amps. Even the smallest industrial motor weighs in at 1/3 horse power, which depending on the motor efficiency is roughly equivalent to 3 to 4 amps! Furthermore, domestic motors are not designed to run continuously and run the risk of overheating if overworked. Industrial motors, on the other hand are designed to be used in factories where they are used continuously, all day, everyday. See the clutch motor mounted under the table? It weighs over 40 pounds alone. There's nothing portable about it and it will run until the cows come home. Nearly all industrials come equipped with a knee lifter. The knee lifter is a big time saver as it allows the operator to keep both hands on the material when pivoting at corners and curves. Additionally, some machines can be outfitted with a foot pedal to actuate the reverse lever. I find it maddening that so many online sellers market vintage domestics as "industrial strength." This is just so far from the truth. And while a domestic machine may be coaxed into sewing a few stitches in a piece of vegetable tanned leather it won't be able to do so consistently as it was never designed to do so. What most people don't realize is that most industrial machines don't sew leather either. There is no such thing as "industrial strength." Industrial machines are designed to sew specific materials. A machine designed to sew light silk looks very different from one that is designed for upholstery. The Consew 206RB below is triple feed walking foot machine that excels at upholstery work. Don't ask it to sew silk though, It will absolutely mangle lighter materials! Domestic machines are designed for versatility--often loaded with features like automatic buttonholes, decorative stitches and droppable feed dogs. They handle a wide variety of fabrics equally well. Versatility, however, comes at a price and as a result, domestics rarely excel at any one thing. They are, by definition, Jacks of all trades and masters of none. The Singer 491 above is a high speed self-oiling straight stitch industrial capable of running at 5000 stitches per minute! It does one thing and one thing alone, sew in a straight line. In comparison, the fastest domestics top out in the neighborhood of 1600 stitches per minute or so. It's true that the build quality of vintage domestic machines is superb. Compare them to modern plastic machines and its no wonder sellers are labeling them as "industrial strength." If I had to choose, I'd sew on my vintage Singer 301 any day over my Janome 6600. Don't be fooled though. While they are overbuilt for what they were designed to do, they were never intended for full-time production work. If you're looking to step up your production output, I highly encourage you to give industrials a try. Once you work on one of these, you'll never go back. That concludes my primer on industrial machines. Stay tuned, I'll be diving into specific models in future posts.